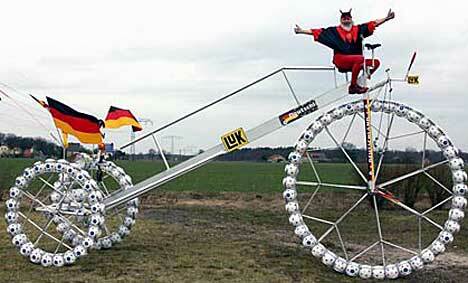 If you follow the Tour de France, you already know Dieter ‘Didi’ Senft. Maybe not by name, but certainly by sight. He’s the bearded nut-job we see pretty much every year by the roadside dressed as El Diablo. Since making his first appearance at the 1993 Tour, in his own eccentric way Senft has now become almost as synonymous with the Grand Boucle as Phil Liggett and Paul Sherwen. So who exactly is he? Well, Dieter Senft is a 61-year old German from Reichenwalde in eastern Germany. Apart from dressing up at major cycling events, he’s also a bit of an inventor who has built over 100 ‘bicycles’, including the largest in the world. It really is enormous, Google it. Whilst most treat Senft as a harmless nutter, his antics have occasionally got him into trouble. During the 2006 Tour of Switzerland he painted his signature trident on the road the day before the competitors came by. Later that day, however, local police arrived and threatened him with a stint in jail. Giro. Mardi Gras. Same same. 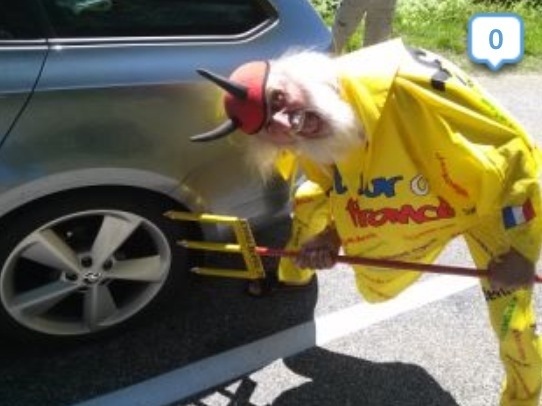 Always one for new ideas, Senft has been seen at the Giro on occasion in a pink Devil costume and on occasion he has been spotted in yellow at le Tour. 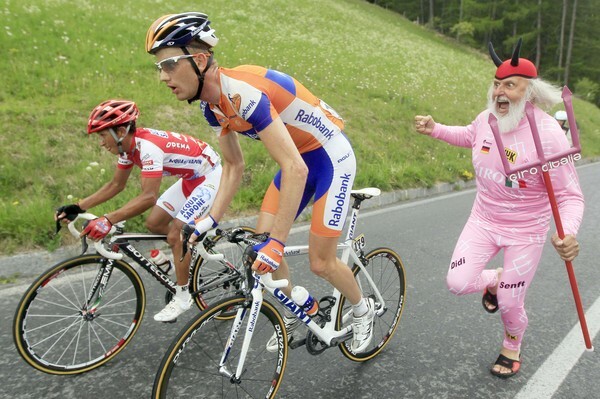 In 2012, he missed the Tour de France for the first time since 1993 after undergoing surgery. “I just got back from having my head x-rayed, the third time in three weeks, I feel like a Chernobyl reactor,” he told Cyclingnews.com. Following his enforced absence from events, Senft was back at the 2012 World Championships in the Netherlands. Scroll to the bottom of this link for a great interview with Senft. The face of Carbon Addiction…..
For now mate, only until I find something else…! !